For a pretty large chunk of the late ’80s, ALF merch was a goldmine. With four seasons of the prime time show and two animated spinoffs, an array of ALF stuff was abundant during that time. Whether you were strolling through Toys ‘R Us or a Hallmark store you’d see ALF everywhere. On the shelves were wise cracking plush toys, (I still have mine!) posters, pajamas, and video games. ALF’s likeness was licensed to everything. ALF even had a couple of sets of his own trading cards. 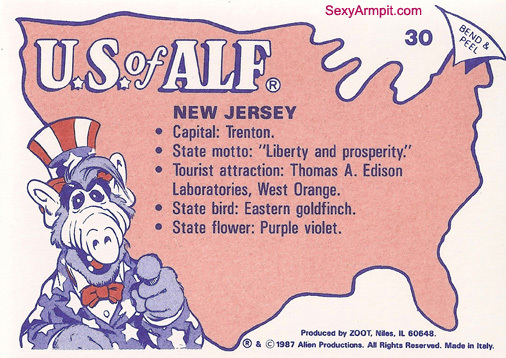 Aside from his “Bouillabase Ball” trading card series, in 1987, our little sarcastic pal also appeared in a 50 card set called U.S of ALF. You’ve probably heard that ancient proverb “He who lets an alien life form give them a tour of the United States, winds up chasing feral cats.” I’ve never been able to get ALF’s actual opinion of the Jersey Shore, but he did make a stop here when he toured the country. 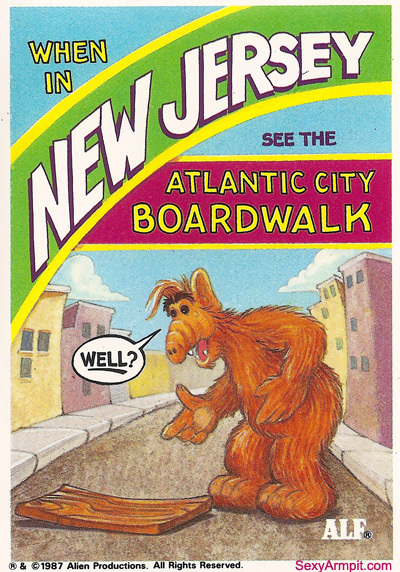 Pictured above is the card commemorating the time when ALF visited Atlantic City, New Jersey.